8 songs are used to demonstrate musical concepts in an easy-to-understand manner. Sid’s mixture of having a wealth of knowledge yet down-to-earth method of explaining gives an enjoyable…often humorous…class for all guitarists and musicians alike. 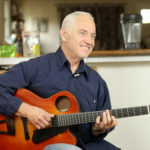 Follow along with Master guitarist Sid Jacobs as he discusses melodies, voice leading, chord/melody [melody/chord], and much more! A class for Intermediate Guitarists or anyone wanting to play their Christmas songs with more confidence. Have a Holiday gig coming up, want to add to your repertoire or enhance what you already know about Christmas tunes? Take a look into the mind of Sid in how he approaches songs…focusing first on melody, adding counter melodies, and playing what the ear is guiding you to play. Over 2 hours of Master guitar instruction by Sid.